The Andean highlands of Ecuador are a marvel for anyone to encounter, with a list of over twenty named (there are numerous unnamed others) extinct and active volcanoes, central Ecuador boasts some pretty impressive views and some even more impressive heights. On a clear day in Quito one can see volcanoes all around, snow capped, conical, rounded or with large craters, each one with its own familiar shape and with that its own sense of personality. They stand like pillars of protection soaring into the clouds yet are powerful and dangerous and threaten to erupt at any moment. For the indigenous people of Ecuador these volcanoes and mountains hold even greater importance in the stories of folklore and mythology. These legends have been passed down through families and communities through story telling. Stories often have themes of love and heartbreak, the volcanoes have been given genders and names, The volcanoes of Ecuador fight over and with each other, own or have children, are the cause of creation for other natural entities like lakes and erupt when angry. For example, Volcano Mama Tungurahua is married to Taita (father) Chimborazo after he won a large battle for her love against other male volcanoes. Quilota and Cotopaxi fell in love and when Guagua Pichincha cries, Cotopaxi replies with an eruption. Whilst I could write about any one of the breathtaking volcanoes I have seen or visited I have decided to write about one of the less well-known ones yet one that is particularly significant for me. The walk to Volcano Kapak Urku or El Altar in Spanish is arguably the most technically difficult walk in Ecuador and in May this year I was lucky enough to trek there, it is one of my greatest accomplishments to date. …As we set off the sun was strong and the way was not flat at any point and there was deep sticky mud to contend with, often getting a boot/foot completely stuck in the mud up to the knee. Horses trot through the track multiple times a day and thus stir up even more mud. The effort to pull out a foot and keep going only got harder as we ascended further into the mountain altitude. We walked for about 7 hours until we finally reached the Refugio at the base of the volcano. The scenery along the way was extraordinary, very lush and green and each time getting a glimpse of a view that got higher and higher: dense forest to open plains full of wild horses to freezing streams. Altitude is a difficult thing and affects you physically and mentally. It’s all in (trying) to breathe. The view of the Refugio with the backdrop of the volcano in full view was spectacular, a huge relief and a wonderful reward for our hard days walk…. Kapak Urku is an important mountain meaning “almighty mountain” in Kichwa and indeed it is important for being so historic, it was active over two million years ago but remains to impressively tall and large. Kapak Urku is a male volcano and legend has it that he once upon a time he was in love with Mama Tungurahua, a female volcano close by however, as mentioned above Tungurahua had a longstanding relationship with Ecuador’s largest volcano – Taita Chimborazo. A jealous and angry Chimborazo found out and sent Kapak Urku a strong message, and using a smoke he burnt the top of the volcano which caused the crown of the volcano to collapse and in turn created the Laguna Armarilla. Perhaps it is filled with Taita Kapak Urku’s tears and perhaps this is why dear wounded El Altar is a forgotten volcano against the famous Chimborazo. 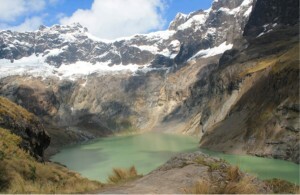 El Altar is located south of Quito close to the city of Riobamba. The Spanish conquistadores named it El Altar meaning “The Altar” in English, as they believed the peaks of the volcano resemble nuns and friars standing around a church altar and overall it was reminiscent of a huge cathedral. The snow-capped volcano is majestic and dominating and stands at 5319 meters above sea level, I walked to the refuge at the base of the volcano and then ascended to the Laguna Amarilla the following day. Ecuadorian folklore stories are important as they value cultural identity and its traditions. They also comment on the universal characteristics of human kind and as indigenous belief suggests we should acknowledge the greater, natural world around us. I feel incredibly special to have been able to visit El Altar, a remote and extraordinary place and I would encourage any visitor to Ecuador to enhance their mountaineering experience by finding out a bit about the legends and stories of the volcano they choose. 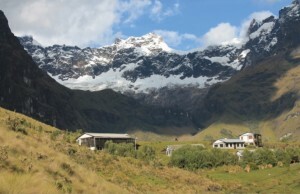 Cotopaxi, Illiniza, Quilotoa, Corazon, Carihuairazo, Chimborazo, Pululagua, Cayambe, Imbabura, Tungurahua, Cotocachi, Reventador, Rumiñahui, Sangay, Pichincha, Antisana.